Hackdirt Caverns is a small cave underneath Hackdirt containing Hackdirt Brethren (quest related). 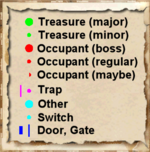 It contains only one zone, Hackdirt Caverns. This cave contains 28 Cairn Bolete plants and 30 Wisp Stalk plants. In the Hackdirt Caverns one can hear animal-like growls every few seconds. This is especially noticeable if you turn the music volume down to zero. No explanation is ever given for these growling sounds, although it is reasonable to assume they are the sounds from the Deep Ones. The Hackdirt Caverns is an excellent place to raise your heavy & light armor skills; simply allow the Hackdirt Brethren, preferably all of them, to gang-beat you as you stand idle. Just be sure to have enough shield and restore health potions and/or spells on hand to prevent them from killing you. And because they respawn after a few days, this can be done over and over, without any consequences. 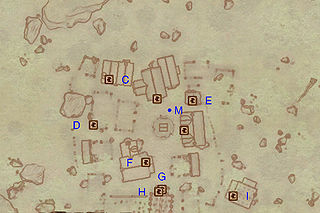 This location's map marker (M on map) is named Hackdirt (editor name HackdirtMapMarker). The entrance door is S of the marker, 110 feet away. 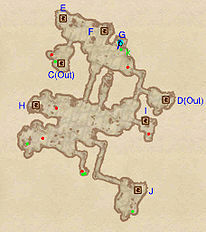 The primary use for these caverns is as part of the related quest, but these caverns do have a number of minor loot chests, and allow you to travel around Hackdirt without going around its exterior. There are six Hackdirt Brethren in this zone, which are hostile to you and therefore will attack you on sight. Be cautious when fighting these enemies, because the caverns are small enough so that you will alert the rest of the Dark Brethren if you get into a fight with one of them. As part of the aforementioned quest, Dar-Ma will be behind the Gate at G inside of the prison cell, which is locked. However, using the key at k, you can open the gate at G and free her. 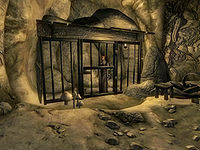 The easiest way to get to the prison cell is by entering Hackdirt Caverns through door F, which is behind a barrel on the first floor of Moslin's Inn.